I’m not a sugary-sweet food type of person. I’ll almost always choose savory first. Even when it comes to dessert, I prefer things with depth and a good balance. If it tastes like it’s going to dissolve my teeth with sugar, I’ll typically pass. But that said, I still love chocolate. Preferably dark chocolate. And I love coffee. So what even better than dark chocolate, or coffee? When you combine them. This recipe is super quick to prepare, and makes a delicious treat that’s perfect for breakfast or a snack. I usually throw this together before leaving for work in the morning to have as a mid afternoon snack, but you could also make it at night so it’s ready first thing in the morning. 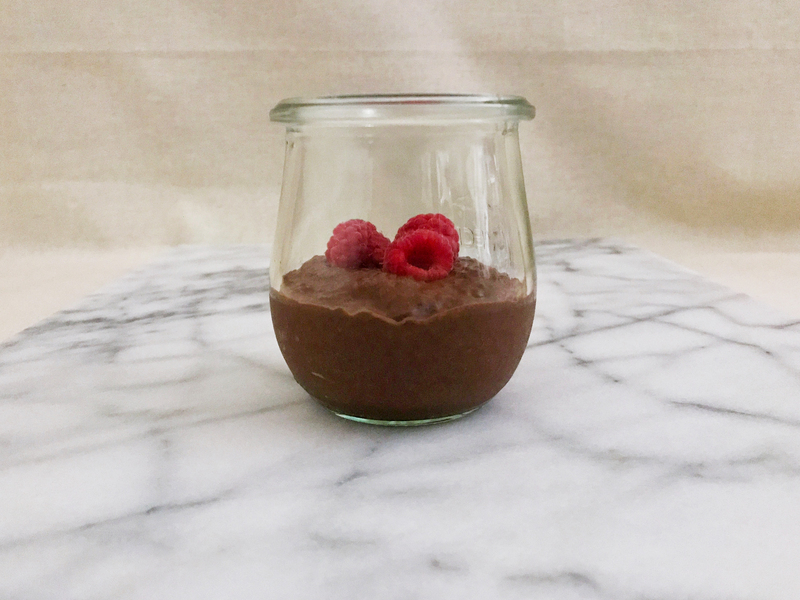 NOTE: I make this in a measuring cup, adding everything but the chia seeds, and fill until the total ingredients reach the 1/3C mark. It does mean that I probably use less than the 1/3C listed, but the measurements can be adjusted to your taste. It depends how soupy you want the end result! Step 1 Mix the cocoa powder, coffee powder, sugar, salt and vanilla extract in a small bowl. Step 2 Add in a bit of the coconut milk, and mix into a paste. I find that the cocoa powder is easier to stir in this way. Step 3 Stir in the rest of the coconut milk. Step 4 Add the chia seeds, and mix everything together, making sure none of the seeds or cocoa powder is stuck in clumps. Step 5 Let sit closed in the fridge for at least a few hours, preferably 4 hours minimum or overnight. Step 6 Stir before eating, and enjoy! So here goes….well, hopefully much more than nothing! I’ve always loved food. Ask almost any friends from high school, and I can tell you that a number of them will be remembering egg rolls and fajitas any time they think of the Millers. They might drool a bit thinking of it, too. My family has always cooked most things from scratch, and I grew up with fresh bread made every week, meals that dad spent most of the day preparing, and family gatherings full of a whole variety of deliciousness. My uncle is a professional chef, my aunt is an amazing baker, and everyone else just has skills. I usually prefer savory over sweet, will always choose real ingredients over processed foods, and hate the fact that my body stopped liking onions and garlic a couple years ago. Now onto the name: my family has a thing for biscuits. As this gets going, I fully intend to pull together the Miller family recipes, and hopefully others will love them as much as we do. For now, the family recipe archive is going to be just this one, but it’s absolutely the iconic one. See, we compete on this one. It’s my grandmother’s recipe, and I remember my dad telling us how she used to make them in the morning when they were growing up. He made them for us when we were little, I’ve made them for years, and my uncles and cousins all make them as well. The competition part comes in because of my dad. He decided one year that one particular batch was especially picture worthy, so sent it as his Christmas card to his family members, and maybe a few friends, along with a classically Jerry Miller-esque alliteration about harrowing harridans, howling harpies, and beneficent bounty. 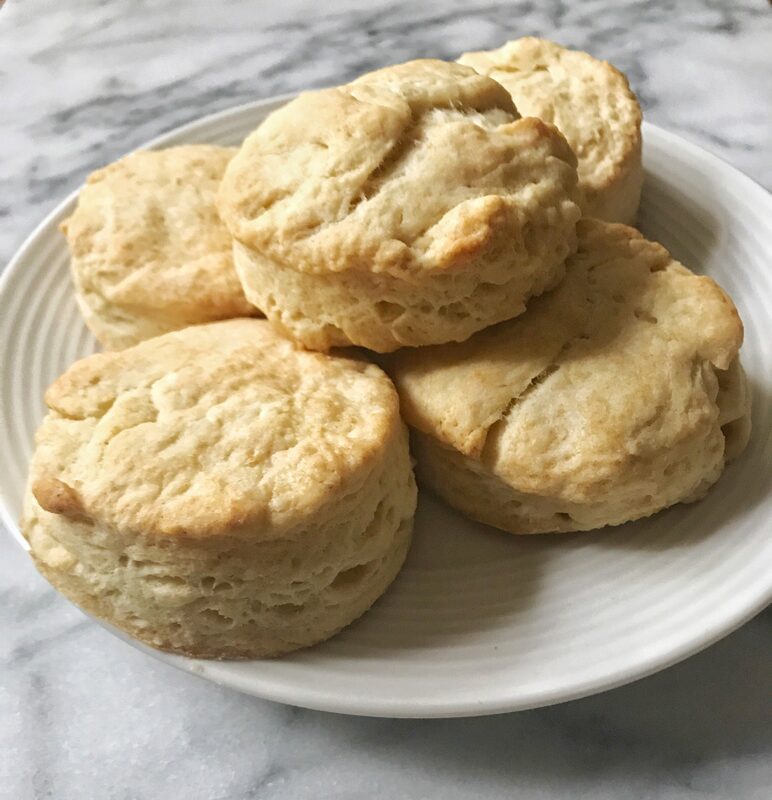 One uncle retaliated with a photo of his own, and now every time one of us makes a better than average batch of perfectly fluffy, well-risen biscuits we have to share proof. 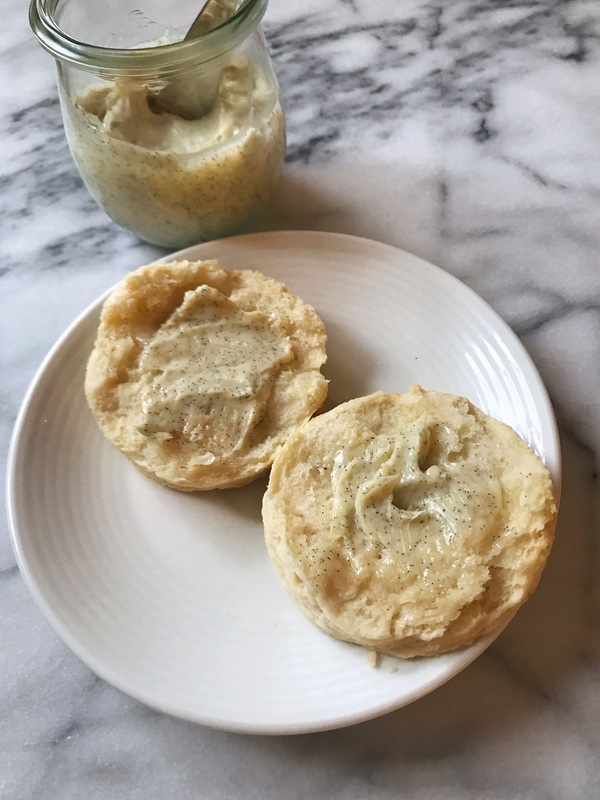 I spoke to one of my uncles not long after deciding that I was going to start this blog, and he mentioned that both he and my dad have most of the old family recipes written down. I love the idea of collecting them all here, and of course sharing them for everyone to try. Hopefully you’ll all love them as much as we do! I of course got Grandma’s permission, because I can’t start a Miller Family Recipe archive without the matriarch’s ‘ok’. I also asked my family to send me their own pictures of the biscuits, because if I’m going to tell everyone about our competition with them, I think it’s only right to share the outcomes. 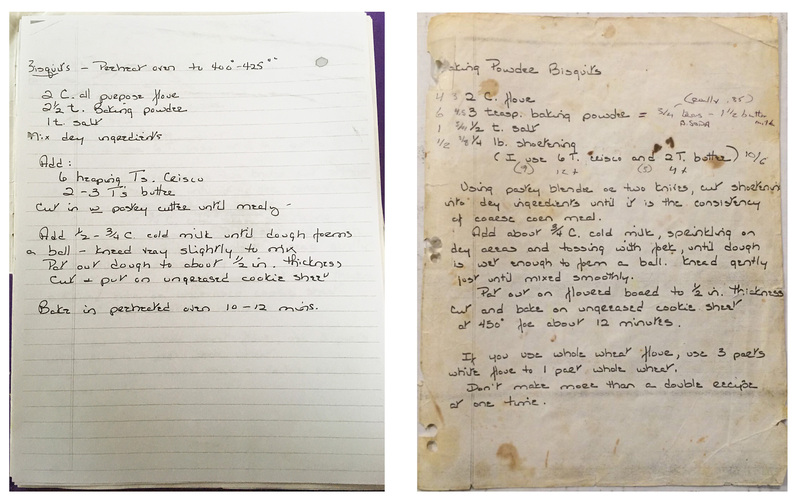 One of my cousins sent me a picture of the copy of the recipe she uses (above left), in Grandma’s own handwriting, which I love, but I also noticed something….we have different recipes!! All this time we’ve been showing off our biscuit skills, it’s been with different measurements. I mean, I love the version I’ve always used (above right), so that’s the one I’ll continue to use, but I will definitely have to try out this one to compare. I made this batch on Mother’s Day weekend, and kept seeing all the sweet treats people were making for their moms. Since my mom is five hours away, I didn’t get to see her, but I was inspired to make this vanilla-rum butter nominally in her honor. I hope she’d love it, but since she hasn’t tried it yet I’ll just assume it passes with flying colors. I think it’s amazing, and one of those quick and easy recipes that’s deceptively fancy. It definitely makes simple biscuits seem much more sumptuous! Step 1 Add dry ingredients to bowl. Step 2 Using a pastry cutter (or two butter knives), cut the butter and shortening into the dry ingredients until the consistency of coarse corn meal. Be sure to keep the butter cold! Minimize the amount of time the dough spends in your hands, or the biscuits won’t be as fluffy and flaky. Step 3 Sprinkle the cold milk into the dry ingredients, tossing with a fork until it forms a wet dough. Step 4 Knead gently (and quickly) until smooth. Step 5 Place dough on floured cutting board, roll out to about 1/2 inch thick, and cut with a biscuit cutter (a glass works well too). Step 6 Place on an ungreased baking sheet and cook at 450 for about 12 minutes. This may be one of my new favorite things. Step 1 Split open the vanilla bean, and scrape all the deliciousness inside into a bowl. Step 2 Add the softened butter and mix until thoroughly combined. Step 3 Add the rum, half at a time, and taste after 1/8t. Honestly, I almost didn’t add more rum, but I thought the flavor was just a little too subtle. Step 4 If you want the butter to be a bit sweeter, add a touch of honey, a bit at a time, until you’re happy. 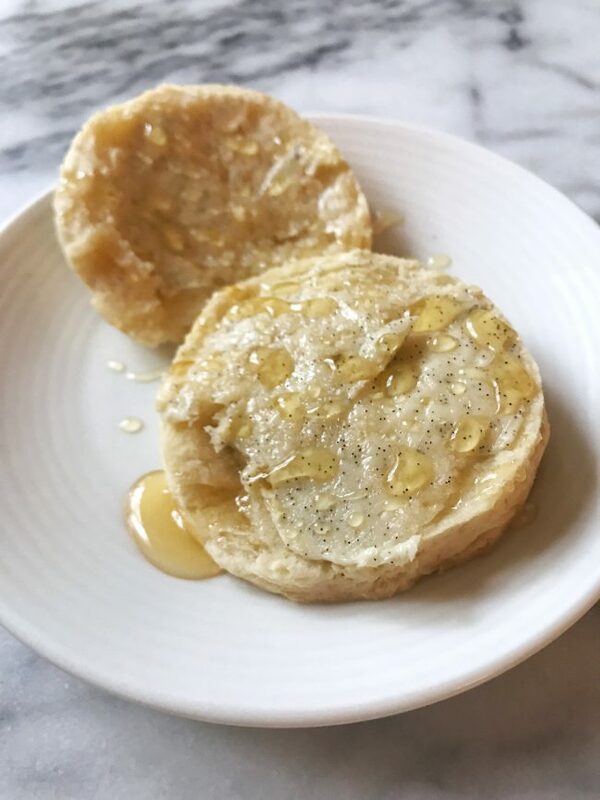 My favorite way to eat these biscuits is warm, slathered with butter, drizzled with lots of honey, and then mashed with a fork in a bowl. Looks messy, tastes amazing! This vanilla-rum butter is definitely stepping the whole thing up a notch, and I think I’m ok up there.